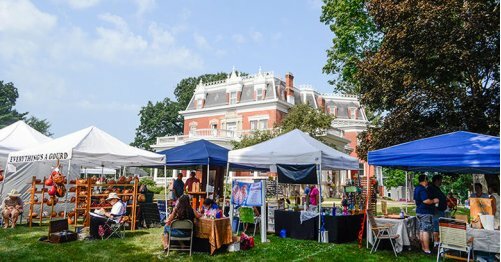 Families are invited to enjoy a day of fun with art, music, history and food on the grounds of the historic Ellwood Mansion at the 47th annual ice cream social. The event will be from 10 a.m. to 4 p.m. Sunday, Aug. 7. From 10 a.m. to 4 p.m., multiple artists will exhibit and sell their work on the front lawn of the mansion. A variety of works will be available including paintings, prints, sculpture, ceramics, photography, jewelry and fiber arts. Live musical performances throughout the day will include folk rock duo Patchouli’s “Concert Under the Trees” on the front lawn of the mansion from 11 a.m. to 1 p.m., a dance performance by Ballet Folklorico Monarcas from 1:15 to 1:45 p.m. and the DeKalb Municipal Band’s annual concert from 2:30 to 3:30 p.m.
First-floor tours of the Ellwood Mansion and the Ellwood-Nehring House will be offered from 11 a.m. to 3 p.m. An $8 ticket allows visitors to tour the first floor of both historic buildings. Tickets will be sold at the information table in front of the mansion and inside the Visitor Center. A variety of food will be for sale on the grounds starting at 11 a.m. Vendors include the DeKalb Rotary Club, Culver’s of Sycamore and Boy Scout Troop 33. Pie and cake will be sold by the Ellwood House Association. The DeKalb Area Garden Club will present garden vignettes for purchase in the Visitor Center throughout the day, and club members will be present to share information and answer gardening questions. Additionally, artwork by KVAL members will be available in the Visitor Center. Other local nonprofits, including the DeKalb Area Agricultural Heritage Association and Gurler Heritage Association, will offer information and activities throughout the day. Onsite parking at the Ellwood House Museum is very limited. Visitors should use legal street parking near the museum and public parking lots. The Ellwood House is at 509 N. First St. in DeKalb. For information and for a complete event schedule, visit www.ellwoodhouse.org or call 815-756-4609.